Jill Sander’s Fall 2011 Runway Collection was a high-octane Color-Presentation. While I wasn’t blown away by the designs, I was by the Runway-Makeup. This show took the kind of chances that make way for real change. Her Models were wearing a combination of colors that have rarely been seen together in such a commercial way. The true paradox of this show, was that – Where her Clothes Failed her Makeup Sailed. The “Makeup Styling” did exactly what her designs couldn’t, it brought in-congruent colors together in a truly unique/pleasing way. The pieces in her Show were an extreme hit or miss. For every fabulous color-combo, there was something that look like something left-over from the set of the 80’s Cosby Show. Showing that we can mix a teal/green with red/orange and come out looking super-sophisticated – was unexpected. This is a gorgeous look, and is a fabulous take on a super-simple eye. 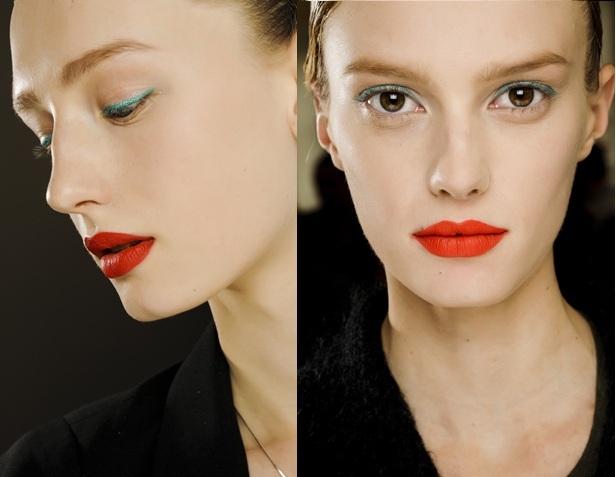 This is the answer for those of us who can’t pull off a naked eye and hot-red lips (we’re not all Scarlett Johanssen). So takes notes, and start looking for a Fat (Green) Eyeliner – I’d start with Too-Faced & Tarte. And for the Lips – you’ll have to experiment a bit to find the right shade for you – but don’t even think about a gloss. 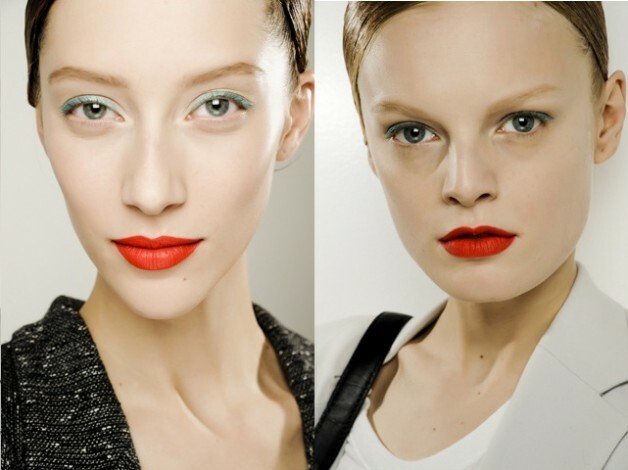 Vogue Italia Gets Us Pumped 4 Spring With Runway Beauty Tips.